A stone's throw from the sea and within walking distance of Mokapu Beach, Ulua Beach and Keawakapu Beach, Andaz Maui at Wailea Resort is a short 30-minute drive from Kahului Airport. 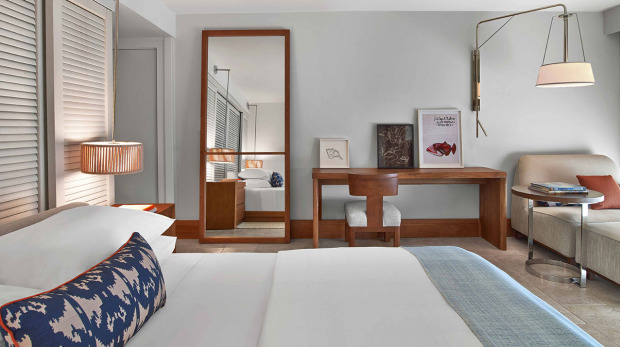 An impressive roster of 15 accommodation categories is available for guests to choose from, culminating in 290 guestrooms and suites as well as seven stunning residential villas. Stretch out on your private lanai and watch the sun set over Mokapu Beach, or admire the view under a leisurely shower - invigorating bath products and all. Eco-conscious and modern, Andaz Maui combines the signature Andaz style with a knack for focusing on the things that make Maui so special. Natural beauty and laid back pleasure are never in short supply here, while diversions like golf, watersports, wining, dining, and shopping complement the tranquility of the property perfectly. Time to pack those bags. Send an availability request with your requested dates to the Andaz Maui at Wailea Resort.